Some students really struggle with counting on. They may have trouble starting with the largest number. They may want to count both of the addends. It can be so confusing for young learners. I was teaching this strategy to a group of first graders. I modeled "touching" my head and said, "Put the larger number in your head and count on the smaller number. We practiced as a group and then the students began working independently. I walked around the room observing and guiding the children. After about five minutes the students went from "touching" their heads to slapping themselves on the forehead. Needless to say we moved on to put the larger number in your pocket the next day. If I were planning to teach this strategy today, in guided math groups, I would pass out laminated pocket shapes, pennies and number cards. 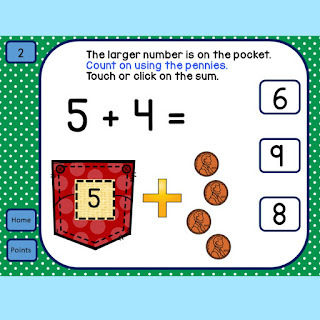 I would say, choose two number cards, put the larger number on your card, count on the second number, using the pennies. I would observe the students and have them tell me the sums. After the students had had many opportunities to practice with hands on materials. 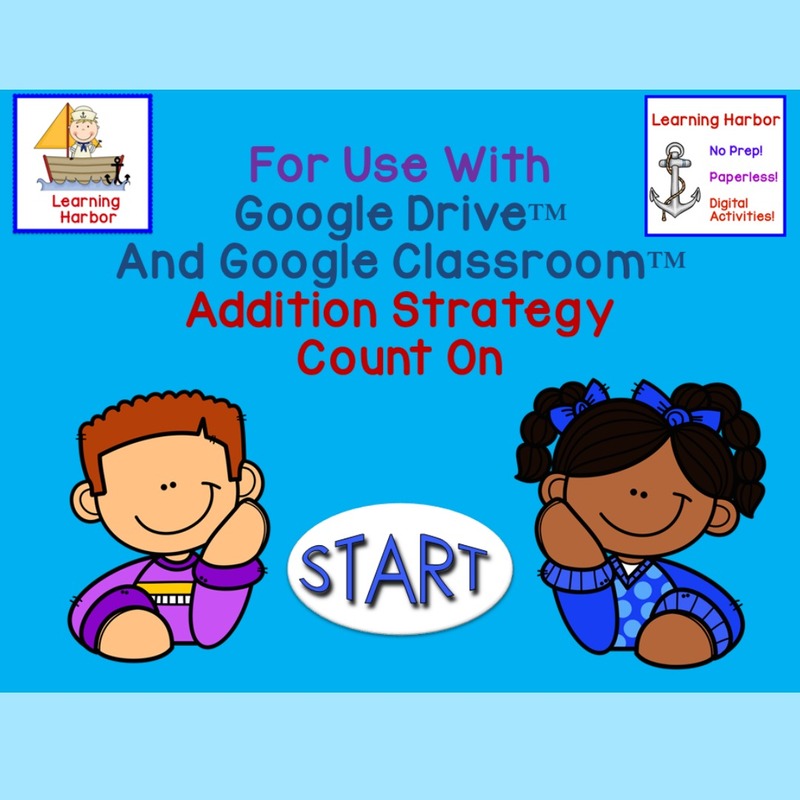 I would introduce the Addition Strategy Counting On for use with Google Classroom™ activity. One slide from the activity is show above. 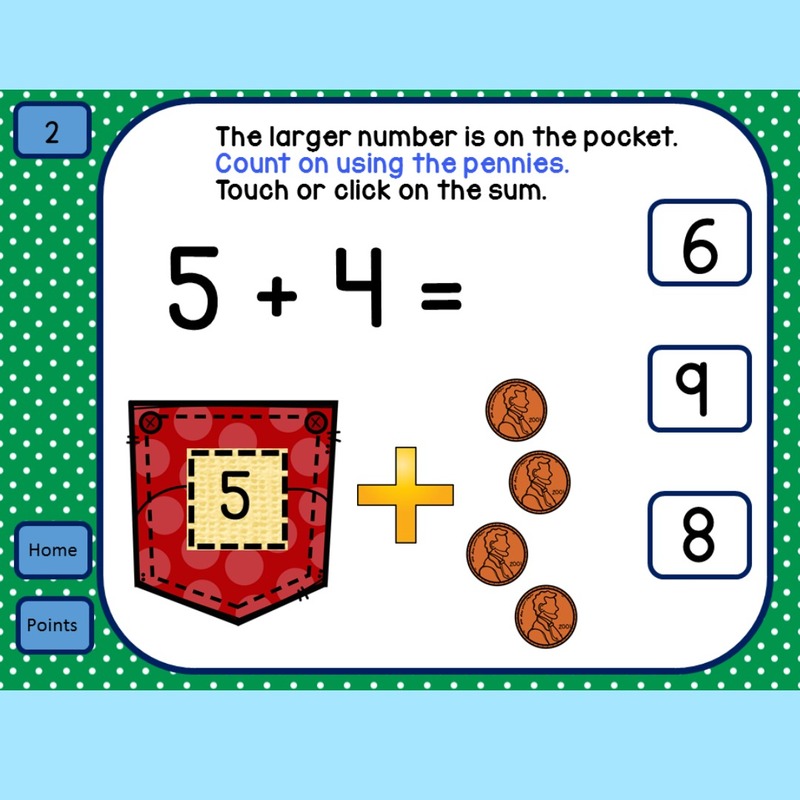 This activity will help students to continue to practice Counting On in a meaningful way. It takes many repetitions for a strategy to become automatic. This activity is designed to provide repetitions while keeping the student engaged. Visit our TpT store, follow us on Facebook, Pinterest and Instagram.